When it comes to weight cutting, you’d be hard pressed to find another fighter that drops as many pounds as UFC welterweight Anthony Johnson. As unbelievable as it may sound, it’s been reported that “Rumble” has lost as much as 50 pounds to make the 170-pound limit. 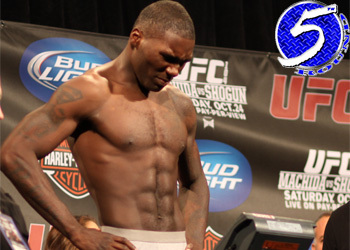 Johnson has had trouble making weight in the past, as witnessed at the UFC 104 weigh-ins this past October when he had to be carried off stage after tipping the scales. Johnson has been out of action since having his three-fight win streak abruptly snapped by No. 1 welterweight contender Josh Koscheck at UFC 106. His return bout was scheduled to take place at UFC on Versus 1, but a nagging knee injury forced him off the card and may cause him to take even more time off. “Because of his knee injury, his weight has gotten up a little bit, and we don’t want to delay his comeback because of a weight issue. So we’re entertaining the possibility of taking a fight at 185 (pounds),” Johnson’s agent Ken Pavia told MMAJunkie.com. UFC middleweight champion Anderson Silva is also known to cut a large amount of weight for his 185-pound fights, as he generally walks around at 220 pounds. Although Pavia mentioned that Johnson is currently “considering” a temporary move to the middleweight division, nothing definite has been decided regarding his client.